KitMonsters – Fender Jaguar. The music makers’ guide to making music. 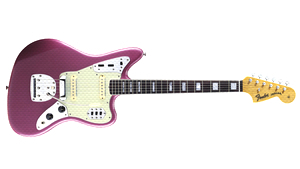 In response to the popularity of the Jazzmaster amongst the surf rock guitarists, Fender created a shorter scale cousin called the Jaguar. With different pickups, and a range of configurations using the many switches, it was perfect for the percussive tones of early surf rock. Later use of the guitar in the alternative rock scene saw many modifications, most notably the double humbucker version that Kurt Cobain had made for him, which was later released by Fender.